New Delhi, June 29: Sadhvi Pragya Singh Thakur cannot avoid the connection with her motorcycle, the Special National Investigation Agency court said. 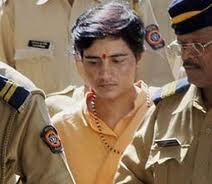 The court had rejected the bail plea filed by Sadhvi Pragya, an accused in the Malegaon blasts case. Bengaluru, June 6: Sadhvi Pragya Singh Thakur’s bail plea will be heard by a special court in Mumbai today. The National Investigation Agency which had given her a clean chit in the Malegaon blasts case will not oppose her bail plea. An NIA official informed OneIndia that there were no charges against her and hence we had suggested to the court that she be discharged. New Delhi, May 30: Sadhvi Pragya Singh Thakur who was given a clean chit by the NIA in the Malegaon blasts case has moved the court seeking bail. In her bail plea she said that she ought to be released as the National Investigation Agency had dropped charges against her. Author Vicky NanjappaPosted on May 17, 2016 Categories TerrorismTags Kumbh mela, Malegaon blast, oneindia.com, Sadhvi Pragya Singh Thakur, Vicky NanjappaLeave a comment on Will Sadhvi Pragya be allowed to visit Kumbh Mela? New Delhi, May 16: The National Investigation Agency in its chargesheet says after a painstaking and professional investigation it has recommended 10 names for prosecution in connection with the Malegaon 2008 blasts case. The NIA had also recommended dropping of charges against 6 persons including Sadhvi Pragya Singh Thakur. Mumbai, May 13: Sadhvi Pragya Singh Thakur is likely to get some relief and there is a possibility of her early relief. The National Investigation Agency which is probing the Malegaon 2008 blast case is likely to tell the court that is no evidence against Sadhvi Pragya. Of all the accused in the case, the NIA suggests that the case against Sadhvi is the weakest. She had been arrested by the Maharashtra ATS on the charge that it was her motorcycle that was used to plant the bomb at Malegaon in 2008. The National Investigating Agency (NIA) will seek custody of Sadhvi Pragya Singh Thakur and Lt. Col. Purohit, the two accused in the Malegaon blasts case of 2008. The NIA has decided to oppose the bail sought by both the accused while seeking their custody. On September 29 2008, three bombs exploded at Malegaon in Maharashtra killing seven persons and injuring several others. In a judgment that seeks to define the role of the National Investigation Agency, the Bombay High Court has ruled that as a matter of general rule the NIA cannot be prohibited from carrying out fresh investigations or re-investigations in specific cases. A division bench of the Bombay High Court comprising Justice S B Shukhre and Justice S Dharmadikari also held that by tying hands of the NIA unduly, we would be failing in our duty to give full effect to the legislative mandate and which is expressed in plain and clear terms by the NIA Act. Is the Malegaon 2006 blast case doomed? It started off with the Maharashtra ATS arresting several Muslim youth claiming that they were behind this attack and over the years the theory changed and a new set of accused comprising Hindus came into the fray.